Teachable Moments/Teachable Me: Can we afford to homeschool???? One of the things I struggled with when considering homeschooling was if we could afford it. Some of the curriculums out there can be pretty pricey. Some of the ones people recommend most, were out of our budget. These are just a few of my favorite places to go, but a little research and you will be pleased to find there are MANY free resources out there. Decide what's right for you. I homeschooled my 6 yr old since he was small, mainly to pass time together in a constructive way. I wasn't planning to homeschool, but it became such a part of our life, and I had a huge network of friends and support, that we decided to give it a shot. The year before my son was going to enter Kindergarten I did a full time homeschool regiment to find out what worked for us and what didn't. One of the things I learned was that I really needed to find a good concrete curriculum. In spite of all the great free resources available, I felt like all I did was plan, plan, plan. I actually like the planning part, but it was taking time away from my family of very young children who really need mommy's attention and direction at this stage of their life. I found myself planning and putting together lessons the morning of the lesson, I felt frazzled and like I wasn't doing my best job, and I wasn't even sure I was teaching him everything he was supposed to learn. There are a number of others as well. There is a book called 100 top picks by Cathy Duffy that I highly recommend to anyone considering homeschooling, it has great reviews on many curriculums out there. In addition you should check your local resources, there are many used homeschool bookstores out there, they sell the books and curriculum and other resources that homeschool families have sold to them and they are offered at a more affordable price than buying brand new. You may also find a curriculum you love for the core subjects, and then find other free or low cost resources to supplement the other subjects. The beauty of homeschooling is that you can teach what you want. There are a number of Christian books available at the Vision Forum a favorite site of mine for finding supplemental learning materials. 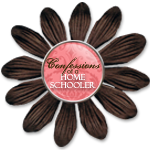 There is such variety out there, that with a little research I think you will find, that you CAN afford to homeschool, at this point for our family, I feel like we can't afford NOT to. Love your blog! I don't plan on homeschooling, but while I'm a SAHM I love enriching my preschooler and tot's day with fun learning activities and crafts....just like you said about working with your 6 year old when he was young...it seems like a good way to pass time! Oh...I'm your newest follower! With Math-U-See, my own Bible Study, and a separate handwriting that I printed off for free.